We get quite a few questions about field trials; how the different types of trials work, how to get certificates and so on. Therefore we’d like to share a chapter from the book with you. We’ll start with the retriever trials. The rules and regulations for retriever field trials vary between countries, but in general they are divided into field trials and working tests. The difference between them is usually that the field trials are during a hunt and the working tests are simulated hunts using dummies or cold game. The different tasks in a retriever field trial are marked retrieves, where both the dog and handler see the game fall and blind retrieves, when the handler knows where the game has fallen and directs the dog into the area. In some countries, sweeping up is also included, when neither the handler nor the dog know exactly where the game is (the handler knows the approximate area). The dog should be able to work both on land and in the water. 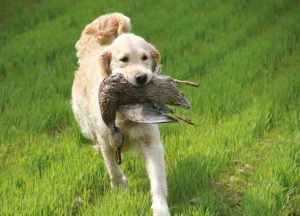 In addition to the hunt related tasks, a retriever needs to be able to wait calmly while other dogs are working and walk beside her handler while other dogs are walking, when shots go off, and when game falls. The dog should be steady and quiet the entire time she is working and not leave the handler’s side without permission. The handler directs the dog using verbal cues, hand signals, and a whistle. In the United States, there are field trials and hunt tests. American trials are set by judges in controlled environments, which are meant to simulate an actual hunting experience. Dogs are run individually on exactly the same test pattern. There are several different clubs in the United States that organize field trials and each has its own rules and regulations. The following applies to the American Kennel Club (AKC). For the complete regulations, visit www.akc.org. AKC has three classes: junior, senior, and master. The junior class is the entry level for the hunt test. The dogs are allowed to wear a collar and leash. Your dog should walk nicely on leash to the spot where the judges have instructed you to go. When you’re ready to begin, you signal the judges. The throwers, who are positioned in the field, will throw and shoot a bird for your dog to mark. When the bird has fallen, the judges will tell you to release your dog to go find the bird. When your dog has found the bird, she should deliver it to your hand in the previously designated area. Your dog is required to retrieve four birds, two on land and two from water, and she will be graded on this. The judges look at marking, style, perseverance and trainability. Dogs in the junior level are not competing against each other but instead scored against a standard. There is a set passing score, and after four passes you’ll receive an AKC certificate and you can add the letters JH (for Junior Hunter) to your dog’s registered name. Your dog has to be at least six months old to enter. The intermediate level in AKC hunt test is the senior class. Here your dog will be working off leash and without a collar. You’ll walk up to the designated starting point where your dog will sit quietly with you until the judges indicate that it’s time to begin. Your dog will now do a double retrieve (mark two birds) and deliver each bird to hand. There is a double retrieve on land and one from water. 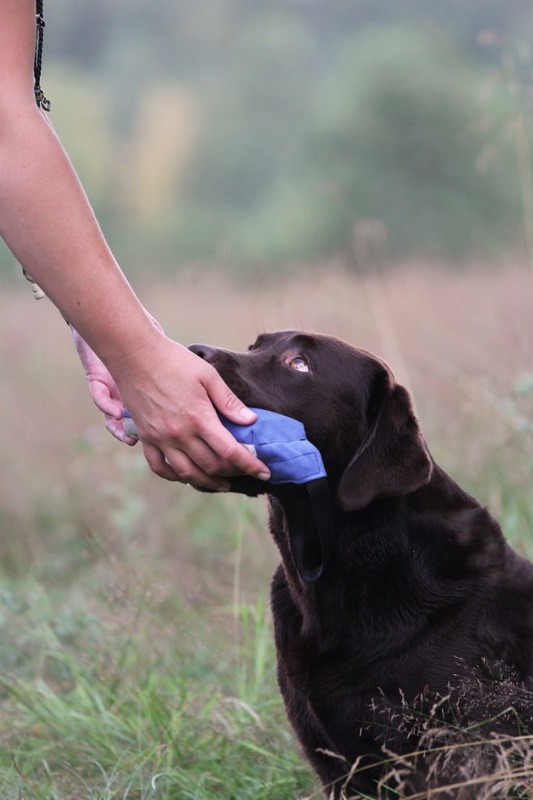 Your dog also needs to “honor” another dog’s retrieve, which means that she’ll be required to sit and watch another dog on the line perform her retrieve. The senior level also includes blind retrieves. This means a bird is placed out of the dog’s line of sight. The spot will be marked for you as a handler. You and your dog now get to find the bird together as a team. The dog will be tested on two blind retrieves, one on land and one in water. As at the junior level there is a set passing score and your dog needs to pass four times to receive the certificate and get to add SH (for Senior Hunter) to her registered name. The most advanced level is the master class. 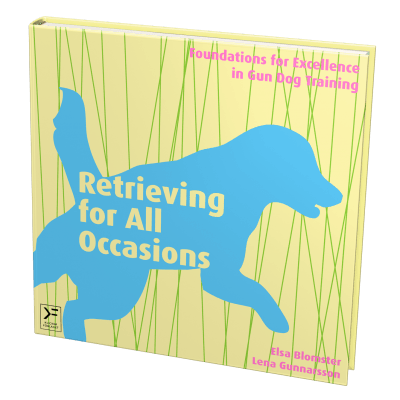 Here your dog needs to be an accomplished retriever, being able to do multiple marked retrieves on land, water or both, blind retrieves at all times, and honor other dogs as in the senior level. In addition, your dog should be able to perform a walk up where she walks next to you while a bird is shot and then sits beside you until the judges tell you to release her. A master level dog is expected to make fewer mistakes, demonstrate a better memory, a higher degree of obedience, and better hunting skills. The master test has to include at least five hunting situations with multiple marks both on land and in water. 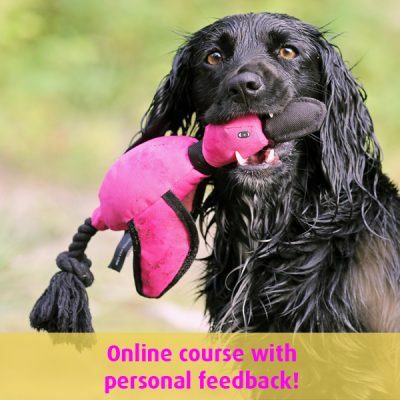 After having achieved a SH title your dog needs to pass five master tests, and if you don’t have the SH title, you need to pass six tests in order to earn the MH certificate and title. 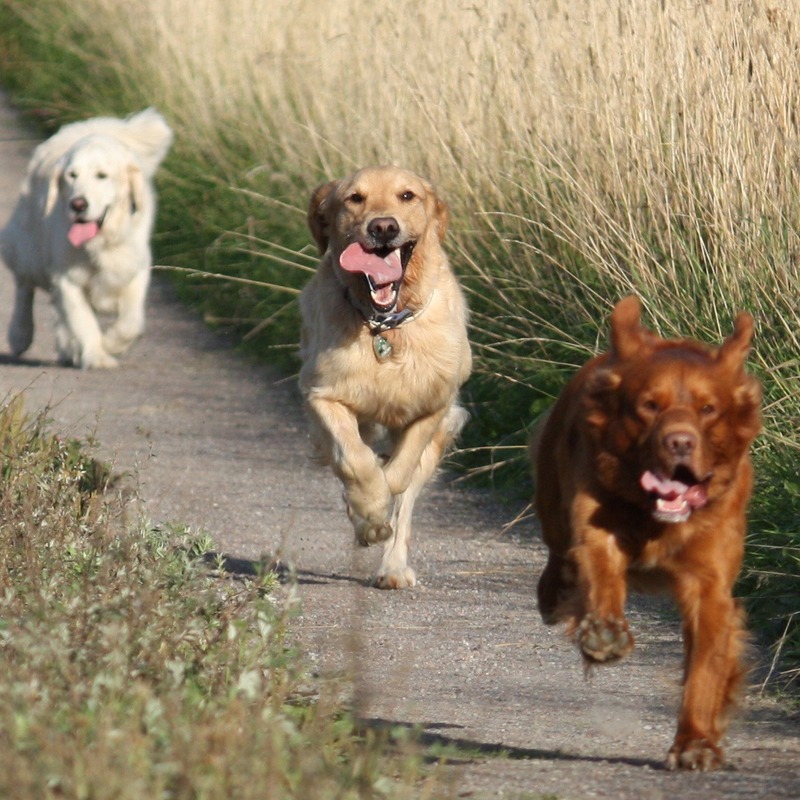 Field trials are used to see how the breeding and training of the retriever breeds are developing. These trials are designed to be more difficult than hunt tests. If nothing else the dog has to cover a lot more ground, making retrieves over 300-600 yards. Field trials have different classes for professional and amateur handlers. Unlike in the hunt tests, the dogs are judged against one another in field trials. Your dog will be judged firstly on natural abilities (memory, intelligence, attention, nose, courage, perseverance and style) and secondly on trained abilities (steadiness, control and delivery). The judges will look at how straight a line your dog works on during the retrieve, if she needs to be directed to find the bird, and her general style. Your dog will also be asked to honor (watch another dog work) during the trial. At the end of each series, the judges will decide on which dogs they want to try further, and they will continue to do this until they have decided on the placing order of the dogs. The titles you can work for in the discipline are Amateur Field Champion (AFC) and/or Field Champion (FC). In order to earn the AFC designation, your dog has to win a National Championship Stake (handled by an amateur, see the AKC handbook for further information on the regulations for this), or win 15 points with at least one win of five points or better in certain specified classes (for example Owner Handler All-age). To earn the FC title you dog needs to win a National Championship Stake or win ten points, in for example Open All-Age. In the UK, the primary organization for official field trials is the Kennel Club. There are field trials, Gundog Working Tests, and Working Gundog Certificates. The field trials are the official trials and therefore the more important competition. For the complete field trial regulations, visit www.thekennelclub.org.uk. Field trials are held in the shooting season – usually from August to the end of January. A trial takes a full day, and some trials are run over two or three consecutive days. Field trials can be done in two ways: Firstly they can be walked up where the handlers and dogs walk in a long line and the game flies up ahead or as they pass is shot, or secondly they can be driven where the guns and competitors stand still while the game is driven over them and shot. The distances aren’t as great as at the US trials. They are usually not greater than 250 yards, but there is no upper limit. While the dogs and their handlers wait for their turn, they walk in a group behind the line with the dogs on leash. This is called the Gallery – with the Chief Steward – and there will be someone carrying a red flag to indicate where the group is. When it’s time for your turn in line, you will be directed by the Chief Steward to which place to take and then remove the leash when instructed to do so by the judge. The dogs must be prepared to wait. It’s extremely important the dogs remain quiet and steady even when they are not working. 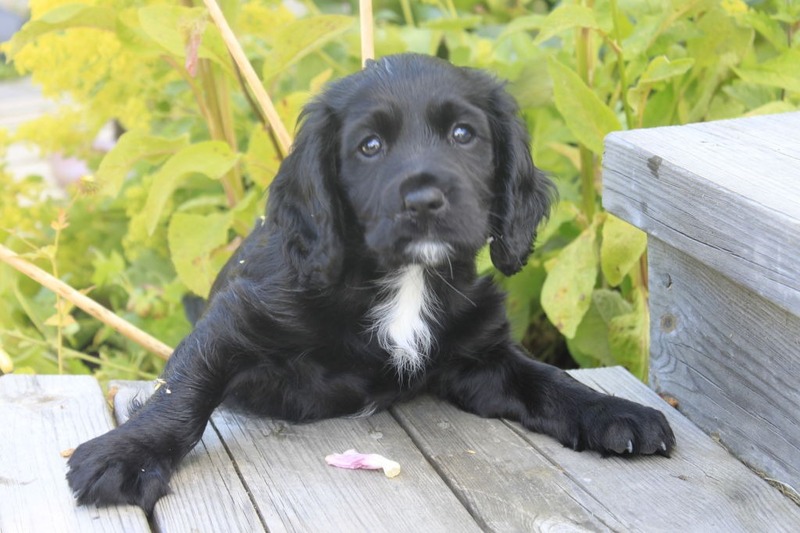 Your dog will be judged on her marking ability, natural game finding ability, control, drive and style, being quiet, her retrieve and delivery as well as nose and quickness in gathering up the game. You’ll first be judged by one pair of judges, and if you’re successful then go on to a second round with a second pair of judges. 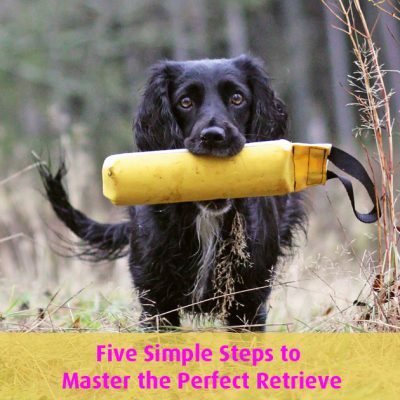 There isn’t a set minimum number of retrieves in order to win a trial, but in general there’s a minimum of five retrieves for a Novice Trial and six for an Open. It’s not possible to say what kind of retrieve you’ll encounter since it’s all “live” shooting. There are three stakes: Novice, All Age and Open. In order to be allowed to start in the Open Stake you must have won a Novice trial. It’s in the Open Stakes you can get your Field Trail Champion title (FTCH). To be awarded the title you either have to win first place in two different Open Stake trials (one two day stake with 24 dogs and one with at least twelve dogs, so in total either two two day open stakes or a two day and a one day open stake), or be placed first in the yearly international retriever championship. You also have to gain a Drive and a Water Certifcate to gain the FTCH title. There is also an unofficial Field Trial Winner (FTW) title that states the dog has won a field trial. A working test is an unofficial competition intended to simulate a shoot (in the US called a hunt) and thereby assess a retriever’s working ability. During a working test, live game is not shot and dummies are used instead. Working tests can be run any time during the year and are most often only open to the arranging club’s members. A working test consists of four to six exercises, each of which is worth a maximum of 20 points. Sometimes the assessment is based on how long it takes for a team to complete a task. The winner is the one who receives the most points. If two dogs receive the same number of points, the tie is broken by holding a run off where the dogs perform various tasks until a winner can be determined. Your dog’s dummy finding ability, speed and directness of the retrieve will be judged. The judges are looking for good marking ability, quick pick ups, fast returns, natural nose, quietness, control, drive, and style. There are four classes in the Working Test: Unclassified, Puppy, Novice and Open. This certificate’s role is to provide proof that a dog and handler team is qualified to work on an actual shoot. The WGC is not a competition, but there are criteria your dog will be measured against. The Kennel Club awards the certificate and will list the tasks that were completed on the day. You can get a WGC on game or dummies. Your dog’s control, obedience, temperament, hunting, and retrieving are all being assessed during simulated shooting field exercises. There will be shoot assessors observing all participants throughout the day. Handlers and dogs walk together to the starting point with the dogs off leash and under control, and a simulated drive with dogs assessed both in the beating line and waiting at pegs. The dog will be assessed when hunting for seen and unseen dummies after the drive, fetching a marked retrieve from water and a marked retrieve from over an obstacle as well as in a steadiness exercise where dogs are left together while handlers collect decoys. The WGC is open to all Kennel Club registered gundogs and their handlers. Some countries also have official field trials that only use cold game. Sweden, for example, has two kinds of official tests, field trial that involves a hunt and field trial where cold game is used. Sweden also has an unofficial working test that uses dummies. For the specific rules in your country, contact your local Kennel Club or Gun Dog Club.